1. Put 1 teaspoon of water and 6 drops of green food coloring into a zip-lock baggie. Add 1/2 cup of rice, seal the baggie, and squish around until all the rice is coated and covered. Spread the colored rice onto a wax paper-lined baking sheet to dry. Your rice will be dry and ready to use in 1/2 hour to an hour depending on your climate. 2. Cut a paper plate into a wreath shape. The edges don't need to be perfectly shaped. 3. Spread glue all over your paper plate. Sprinkle the green rice over top, press it down a little bit, and then shake off the excess. 4. 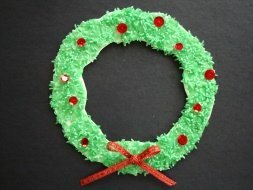 Decorate your wreath with what ever you have in your craft box. We used red sequins as berries and glued on a Christmas bow. Try red pom poms, or shapes cut out of construction paper, use your imagination!